JAFFNA, September 14 – Business is booming in this northern capital. The contrast with the City of Colombo is striking. Shops stocked with satellite dish antennas, some to view Tamil Nadu TV channels, overflow to the pavements. They are aired only a few hundred miles away from the Palk Strait, the thin but marine rich seas that separate Sri Lanka and India. Showcases display flagons of premium Scotch whisky and exquisite brands of Cognac. Large screen high definition television sets, placed on the roadside windows by electronic stores, show Tamil movies. If all that is for the nouveau riche, who have mushroomed after the military defeat of Tiger guerrillas in May 2009, there is also an equal share for those who come from the ‘proletariat’. Factory off-runs of garments with popular brand names like Levi’s, Wrangler, Adidas, Nike, Aeropostale, Mango and Gap are among those piled on payments. They sell more than the small wheeled stalls that market Ulundu Vadai. Even visitors from the South are lured by it. The Central Bus Station is busy as services operate to different parts of the country from Jaffna. The services include not only Colombo but Panadura, Matara and Kataragama. There are yet others to Kandy and Trincomalee. Pavements are being newly laid in city streets, much like in Colombo, and roads are being topped up with brand new layers of asphalt. Concrete and wooden poles have come up along the roadside as power supply from the national grid has arrived. More residents will have electricity now. Telephone cables are being laid for more connections. That will no doubt pave the way for more residents to access the internet in a society where learning is almost next to religion. The story of development is further reflected in the large loads of cement bags workmen pile on tractor-trailers, lorries, vans and even hand carts. This has created job opportunities for skilled and unskilled labour. Masons and carpenters are earning premium wages. Buildings, some multi-storeyed, are springing up in the city and suburbs. 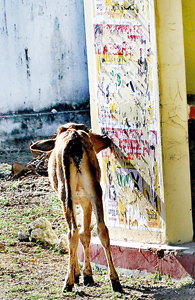 This is the same story in the other four districts besides Jaffna — Kilinochchi, Mannar, Vavuniya and Mullaitivu. There the road development programmes are intense. Many a house has been converted to guest houses or restaurants to accommodate the large volume of domestic tourists and a lesser number from abroad. Upmarket restaurants are full. A striking feature at night is how relatives crowd a table as their expatriate next of kin or friend hosts a meal. A status symbol is a flagon of Black Label or Chivas Regal Scotch whisky. Food is ordered lavishly. Wine stores are better stocked than those in the south, a marked contrast to the period when Tiger guerrillas dominated the ground. Only one brand of Arrack in pocket sized bottles was then popular. A strong reminder about who is behind the success story of development comes from atop a multi-storied building. It is from a giant screen on a roof in the fast changing skyline. Facing the National Hospital and the Central Bus Station where hundreds gather, the screen displays round the clock crisp, clear colour footage of President Mahinda Rajapaksa. He is seen inspecting development projects in various parts of the country or amidst troops in their colourful camouflage. Similar screens are in other parts of the town too. It is axiomatic for residents as well as visitors, to see the fast changing face of Jaffna on the ground and only raise their heads to look upwards to know who is making it possible. Now there seems another paradox. The Mahinda Rajapaksa administration is looking up to nearly 715,000 voters in the Northern Province to say “yes” to its development programmes that are fast changing the face of Jaffna and other areas. There is little doubt that the transformation from the war-battered days to a modern Jaffna City and a new North is under way. Every day passes with more change. Rajapaksa wants an endorsement during the first ever Northern Provincial Council (PC) elections next Saturday. The PCs were set up under the 13th Amendment to the Constitution as part of measures to address Tamil grievances. However, then the Northern and the Eastern Provinces were merged and had only one Council. They were separated following a Supreme Court ruling on October 16, 2006. A tour of the Jaffna peninsula and some of the adjoining districts tells a story that is different from both the North Western and Central Provincial Council polls, also on the same day. Other than a few posters on walls and lamp posts, banners or paintings of candidate numbers on the roads are absent. There is no feverish polls activity. The only clashes have been intra-party, that too largely within ruling party candidates. A few party offices decorated with their party’s colours manned by less than a handful dot various intersections of the peninsula. Strikingly enough, in the island of Delft, the handful of posters to appear were that of a candidate from a lesser known group. Just opposite the Delft Government Hospital, I saw an impoverished calf eat up a couple of them. Otherwise, most parts of this rustic island, had posters of a smiling Eelam People’s Democratic Party (EPDP) leader Douglas Devananda. This fishing and farming maze of corals where some 1,500 families live, is his strongest support base. Any visitor to the north, particularly the peninsula, could conclude that there was little or no enthusiasm in the NPC polls. That is furthest from reality. The absence of overt political enthusiasm or vibrancy does not mean the northern electorate has gone quiet or has become totally resilient. The cause for the lull is perhaps fear or restraint, or both. However, there are strong undercurrents. Conversations with a cross section of the people I met clearly highlighted two key elements. One is that they do not want to go back to the bloody “war years” again. They said they had “suffered immensely” and lost “near and dear ones.” One of them said “it is not that we have no problems. Some of them we have are quite serious. Yet we have learnt to be happy now.” A Government sales outlet manager declared, “My family and I are for the UPFA. It is doing so much.” However, Siva, an employee of a hotel said, “My family and I will vote for the most suitable candidate. I am not going to say who that is.” His family and he lived for three years in a refugee camp in Tamil Nadu and came back to Sri Lanka under the auspices of a UN agency. Thereafter, he had lived in a similar camp in Puttalam where the majority were Muslims. They have now been re-located to the peninsula. Like Siva, there were many who were non-committal and had reservations on some issues. Despite lack of overt interest in the polls, crowds do turn up for political meetings. President Rajapaksa drew a large number when he addressed a rally in Mannar on Wednesday. It was the same yesterday when he declared open the Kilinochchi Railway Station. One may argue that the Government side had the advantage. But this was not confined to the UPFA alone. The main opposition United National Party (UNP) also drew a crowd that exceeded the number of people at its rally outside the Fort Railway Station early this month to protest the Weliveriya shootings. If the people came to a ground near the much venerated Kandasamy Kovil in Nallur first for a musical show, they waited behind for the last speaker – Ranil Wickremesinghe. His speech in Sinhala was simultaneously translated into Tamil. Larger crowds were drawn by Tamil National Alliance (TNA) chief ministerial candidate, C.V. Wigneswaran too. Of course, in today’s politics, crowds are no barometer to ballots, but it was indicative of the interest in the democratic process of the politically astute northern voter. In another paradoxical situation, the two main contenders at the polls – the TNA and the ruling UPFA – appear to be fighting the polls campaign not in the north but in Colombo. The reason — the main plank of the TNA campaign — its Manifesto. That threatens to widen the chasm between the UPFA Government and the TNA. It is much the same way the earlier UNP Government that entered into the February 2002 Ceasefire Agreement with the Liberation Tigers of Tamil Eelam (LTTE) was locked in a heated controversy over the proposals for an Interim Self-Governing Authority (ISGA). “Prabhaharan is indeed a hero. President Mahinda Rajapaksa knows that the L.T.T.E leader V. Prabhakaran is a warrior. I am not only the person who is in this opinion. The President of this country, Mahinda Rajapaksa has also recognized Prabhakaran as a great hero. I speak out while being on the soil of the birth of Prabhakaran. He is not a terrorist. When Prabhakaran was alive, the President came forward on his own to grant 13 plus and more than that. Now that Prabhakaran is no more, the President has begun to speak of 13 minus and even to the extent that there is no such thing as 13th Amendment. “This was because President Rajapaksa accepted Prabhakaran as a hero. He came forward to yield concessions to the Tamils. But he is not prepared for it now. Prabhakaran is not a terrorist. He is a hero and a warrior who fought for the liberation of the Tamil nation. A Sinhala newspaper that interviewed me recently, quoted me saying that I had said Prabhakaran is a terrorist. I told them Prabhakaran is not a terrorist and that he is a great hero. It is the angle from which we look at, that makes the estimation of the person. In my view he is not a terrorist. Wigneswaran defended his remarks. He told the Sunday Times “Those who are criminals today or those who are wanted people today can become the heroes the next day. I am completely non-violent and vegetarian. I don’t kill. Now I am a politician. So I reflect what people say. They don’t look at him as a terrorist.” His comments in Valvettiturai came as Diaspora groups called for “demilitarisation.” A similar call was also made by United Nations Human Rights High Commissioner Navi Pillay during a visit to Colombo. He said that the Army was 43,000 strong in the Jaffna peninsula in 2007. “When I took over in December 2009 it was 26,400. We have now brought the number down to 13,100,” he added. If you take the Anuradhapura District with training facilities included, the strength is much more. 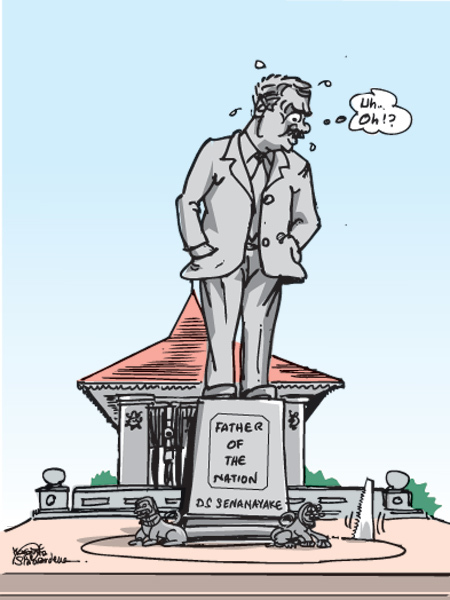 “There is no justification to say the Army has the largest concentration in Jaffna. We are now arranging all our camps in Government buildings and land. We are returning private property,” he declared. Only the 52 Division headquarters remains on private land and will soon be re located. Excerpts of a Q & A with Major General Hathurusinghe appear in a box story on this page. Bishop Savundranayagam added: “The Tamil expatriates believe in the idea of an Eelam. There is nothing of that sort here. People here say they do not want the war. They say they only want to live with dignity with powers and rights. That is what the Government should promote. If you ask the people there is a certain amount of fear in them. There is an underground force which wants to say the Army has the power, the Government has the power and no one should criticise. The people want to be free. Local newspapers complain that they are under threat. The press must have the freedom. Generally speaking there is this fear that the war could come again.” Excerpts of a Q & A with Bishop Savundranayakam appear in a box story on this page. A total of 906 candidates from 85 political parties and independent groups are contesting in the five districts of the Northern Province. There is little doubt that the TNA would be the winner. Even Economic Development Minister Basil Rajapaksa, the architect of development activity in the North through Uthuru Vasanthaya or Rennaisance of the North, has said he would end his role as its head after the polls are over. However, the question everyone talks of is whether the TNA would receive a two thirds majority. The UPFA’s chief ministerial candidate Angajan Ramanathan and his team, backed by several cabinet ministers, are stepping up their campaign until Wednesday just to avoid this happen. For such a sweeping majority would entail a string of political problems. Not that the TNA would embark immediately on demands for Police and Land powers. The Government is still in a strong position to defeat any such moves. One of the TNA’s first tasks if a two thirds majority is won, the Sunday Times learnt, would be a motion to unseat the Governor and call for the appointment of a non-military person. Thus, four and half years after the military defeat of Tiger guerrillas, the North returns to civilian rule of sorts after next Saturday. That is history by itself. For more than three years now Major General Mahinda Hathurusinghe has functioned as Security Forces Commander, Jaffna. He assumed office months after the Tiger guerrillas were militarily defeated and has seen the transformation of a battle scarred city of Jaffna into a modern township. Here are edited excerpts of an interview he gave the Sunday Times. ON CLAIMS OF A TRUST DEFICIT BETWEEN THE PUBLIC AND THE ARMY: It is the other way. When the husband and wife have a fight, the latter comes running to Army camp. I have told the Senior DIG here that these cases should be handled by the Police. They are increasing the police numbers. The public are very friendly with us. Our troops donated about 300 pints of blood every month to the Jaffna hospital. That is about 80 per cent of the monthly requirement of the hospital. When I go for meetings I tell them (jokingly) you are no more pure Tamils. You have Sinhala blood. The doctors are very friendly with us. In fact when there was a suggestion to have a fully-fledged hospital for the military, I said the Jaffna hospital is good enough. The doctors are very friendly and we have no suspicion that they will give us something else for the prescribed medicine. Absolute trust prevails. The distrust is among the politicians and some people in the Diaspora. That is normal. You get it in the south as well. POSTWAR ROLE OF THE ARMY: We have been building houses, schools, cleaning wells, building dispensaries, farms and even manicured gardens. This is to promote goodwill. ROLE OF THE TAMIL DIASPORA: They are busy sowing the seeds of separatism. They have a hold on the people here. At least one person in a family lives abroad. I am not saying that the entire Diaspora is doing this. This has a bearing on national security. We have about 3,200 ex combatants who have been rehabilitated. We do not look into their activities now. There is no monitoring. They could become a readily available force. RETURNING PROPERTY TO ORIGINAL OWNERS: Some houses in the Point Pedro area are now being returned. More than 700 houses and 21,000 acres of land have been returned to the original owners. They were previously occupied by the Army or the LTTE. Those from the international community ask me “when are you reducing the Army?” I tell them to talk about the job they are doing. If the Army has been violating laws, you tell me. Do not talk about numbers. We have built 1,883 houses for the displaced. That is solely using contributions we have received from people in the south, friends overseas and other well-wishers. ON DEMINING: It is only in three per cent of the peninsula – Muhamalai, Kilali and the Eluthumadduwal line – that demining has to be completed. It is a slow process. ON THE ARMY’S HEARTS AND MINDS OPERATION: We have found more than 10,000 scholarships for youth. We are having seminars for GCE Advanced Level and Ordinary Level students. We have livelihood programmes. We have a crab-packing factory for ex-combatants. I used to attend weddings and have sometimes been an attesting witness. I stopped going, because the TNA began saying that one had to get the approval of the Army to have a wedding. The problem is created by politicians. They are losing space. They have been MPs for so many years, but not done anything. ARMY’S ROLE IN SATURDAY’S ELECTIONS: We have absolutely no role to play. It will be a Police job. FUTURE ROLE OF THE ARMY: Our responsibility is reducing. The law order situation is now a Police job. In case there is a need, the Army will assist. MESSAGE TO THE JAFFNA PUBLIC: You have your own judgment. Do not get it diluted by the utterances of those engaged in political activities. The reality is different from what they project. We have seen what has happened due to petty politics in the past 30 years. People paid a heavy price. CURRENT PRIORITIES: To help reduce unemployment. Help the Jaffna farmer get a better price for his produce. Now the crab that is caught in the Jaffna Lagoon ends up on the tables of restaurants in Singapore. Farmers do not get a good price for their vegetables. Beetroot grown here received only Rs 8 per kilo at the Dambulla wholesale market. There is a wrong belief that beetroot from this part of the country does not have a longer shelf life like those grown in the central hills and the south. FOUR AND HALF YEARS AFTER THE WAR: Development is taking place. Roads have been constructed. That is good. Interior roads also are being done. For a long time there has been no development. Infrastructure too has been developed. In places like Mullaitivu and Kilinochchi the interior roads are in a very bad state. The railway is also being developed. Communications too have improved with almost every one possessing a mobile phone. Many of the tanks have been developed. This encourages the farmers. There is a move to bring Iranamadukulam water to Jaffna, water is limited. The ADB has a project, but the Iranamadu tank is rain-fed and it goes dry at times. They cannot deprive the farmers of Kilinochchi. Many schools are being repaired. In the health sector, the Japanese government put up a new building for the Jaffna hospital. Commercial activity with the south is improving. Farmers have a problem of scarcity of water. Some grow vegetables or go for cash crops. But paddy cultivation is limited. There is a limited quantity of electricity. There are power failures which affect the industries. However there are no major industries. Earlier we had the KKS cement factory. Though people are expecting investors, they are still afraid. They say peace has not returned. THE ROLE OF THE EXPATRIATE COMMUNITY: They agitate in their own countries. When the President wants to go to some country they agitate. Naturally it agitates our own leaders. They feel that these people are still there and are rousing up the people here. These things do not help us at this end. We do not want the war. We want to live amicably. We want to have our own rights. That is what the Government has to do without looking with an eye of suspicion. Give us the opportunity to express ourselves. UPCOMING NORTHERN PROVINCIAL COUNCIL ELECTIONS: It is very much welcomed. We were expecting that. Elections are essential in a democracy. My wish is we have free and fair elections without any interference. It is for the people to vote for whatever party they feel will deliver the goods. The security forces should not interfere. ON UPFA GOVERNMENT PROPOSALS TO DO AWAY WITH POLICE AND LAND POWERS UNDER THE 13TH AMENDMENT: I am not a politician to comment on this. But as a common man I feel the solution to the problem is devolution. You must have as much devolution as possible to the provinces so that people can manage their own affairs. If there is anything to restrict this, this is not going to be helpful. The Provincial Council is seen as a way of devolving powers. If the 13th Amendment is necessary for the functioning of the provincial council, it is the Government’s duty to give these powers instead of restricting it. Otherwise it would mean that the Government does not trust the people. The government is still suspicious that the people will not promote unity. Elections are there for the people to voice their opinion. WHAT THE GOVERNMENT SHOULD DO TO WIN THE HEARTS MINDS OF THE PEOPLE, PARTICULALY THE YOUTH: We cannot forget the youth. Education must be promoted. University education, vocational education also must be encouraged. Youth should be given the opportunity. Employment is another aspect. The lack of employment is an issue. Facilities must be there to give employment to the educated. Employment in the Government sector as well as the private sector should be promoted. It is then that the youth will feel that they have work. In order to do that the government should start new ventures here. The private sector also should join the development programmes.